Continuing to use old or obsolete Allen-Bradley equipment is costly - not only due to spare parts costs, but also in reduced productivity. Costs increase due to proprietary communication network limitations, having to work around memory limits, and other factors such as programming/maintenance software not being able to run on new PC's. SoftPLC Corp. provides smooth, inexpensive migration and upgrade paths for users of Allen-Bradley PLC's - in most cases superior to paths that Rockwell Automation provides! SoftPLC has on staff engineers that previously worked for Allen-Bradley, and others that have many years of experience with A-B PLC products. We have converted hundreds of A-B PLC systems - providing customers with a superior controller CPU, while allowing them to retain their original controls investment in I/O and engineering. In most cases, as much of the original I/O racks/modules, field wiring, communication networks, and HMI/SCADA as you want can be left intact. Over time, you can then retrofit other parts of the system (eg: drives, I/O, HMI) as it makes sense to do so. With SoftPLC's open architecture PACs, you have a lot of options on future product choices and virtually unlimited capacity! We offer migration kits starting at only $1495 USD, that include a Smart SoftPLC with a built-in A-B RIO interface, application conversion services, and more. SoftPLC CPU models are available to handle even the largest applications with multiple RIO and communication networks. In some cases, based on the age and configuration of the A-B equipment, it may be more cost effective to convert the logic and documentation but replace the A-B hardware. Reduce the ongoing cost of maintaining obsolete equipment, connect to modern networks, add new functionality or hardware, and more. You can even combine multiple A-B PLC's into a single SoftPLC! Contact us to discuss your upgrade application. Note: Detailed conversion information for each A-B model can be found in the specific model's tab. A Smart SoftPLC can be factory equipped with up to (2) A-B interfaces. Interfaces can be RIO (Remote I/O) channels, either Master (controller) or Slave (adapter), or DH+ (Data Highway Plus). If you need more than (2) interfaces, we offer SoftPLC Gateways and Hardbook SoftPLC options. If the old A-B PLC connected to other I/O systems (eg: DeviceNet), your Smart SoftPLC can also include interfaces for these other networks. Any HMI/SCADA/DCS system can be used, normally without change, as the SoftPLC will appear as an A-B PLC to the operator interface - either as a PLC-5/SLC-500 or using PLC-2 compatibility mode on serial DF1, DH+ or A-B Ethernet networks. Or, you can upgrade the operator interface as well - either with one of our migration solutions, or with any product of your choice - all are compatible with SoftPLC. Most special modules are supported as part of the migration process, or many times the modules can be eliminated with functions that are standard in the SoftPLC (eg: Modbus communication). SoftPLC Corporation has developed sophisticated utilities that automatically convert A-B ladder logic and documentation to our file format. In most cases, the automatic conversion is 98% or better. These tools provide a report that lists not only what may need manual review, but also details about the conversion process such as a cross-reference from old address to new, rung number equivalences, and more. We offer the conversion services as a low flat-rate fee*, with an optional hourly fee for an engineering review of the results and/or manual conversion of any flagged logic. We provide a no-charge engineering pre-review of each application prior to issuing a formal hardware quotation, to help ensure your new SoftPLC based system start-up will be as easy as possible. This review includes an existing system equipment analysis and a review of the program logic, resulting in a list of any potential issues found with recommended solutions. As part of our migration service, we can even ship your new SoftPLC with the converted application pre-loaded. Application conversion is included in our Migration Kits. * For most A-B models, some models are quoted by project. PLC-5 migrations to SoftPLC are unbelievably smooth! Minimal hardware changes are required in most cases. But, even more significantly, the ladder logic is not converted - it is imported! Rarely does any logic need to be changed, since SoftPLC was initially modeled after the PLC-5. This means no re-training of personnel, no re-programming of HMI/SCADA systems, and minimal documentation/drawings re-work. Our migration kits include the SoftPLC hardware, software and application conversion services for simple migrations. If your system was redundant, had multiple RIO or DH+ networks, or other specialty functions, contact us to for an engineering review and quote. SLC-500 migrations to SoftPLC are almost unbelievably easy! Minimal hardware changes are required in most cases. Rarely does any logic need to be changed, since SoftPLC is a superset of the SLC-500 and PLC-5. The primary differences are in the addressing of digital I/O (which the automated conversion utility handles) and the support of third party I/O modules. 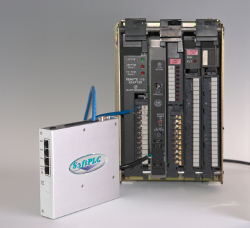 Since the MicroLogix has built-in I/O, conversions are normally done for the logic/documentation only, with the hardware being replaced either by a Smart SoftPLC with either Tealware or another type of I/O, or with a Micro SoftPLC. After conversion, there is little re-training of personnel, minimal (if any) re-programming of HMI/SCADA systems and minimal documentation/drawings re-work required. Our migration kits include the SoftPLC hardware, software and application conversion services for simple migrations. If your system uses third party modules or specialty functions, contact us to for an engineering review and quote. PLC-2 migrations to SoftPLC are almost unbelievably easy! Minimal hardware changes are required in most cases. Logic conversions are normally 98% or better. The converted logic resembles PLC-5/SLC-500/MicroLogix logic, so if personnel are familiar with those models, minimal re-training is required. Existing HMI/SCADA products can communicate to SoftPLC using a PLC-2 compatibility mode, so these often do not require re-programming. Upload the existing PLC-2 program using TOPDOC for PLC-2. As part of our conversion service, we can either provide the loan of TOPDOC PLC-2 and an Attached Mode Cable, a TOPDOC PLC-2 Programming Station (USA only) or program entry services where only a hard copy print of the logic is available. Export the documentation from your PLC-2 programming software to text format. Email these files (or reports) to us. With our automated PLC-2 to SoftPLC conversion utility, we convert the logic and documentation to a single XML file that will load into TOPDOC NexGen. If there is logic that doesn't convert, or needs to be modified, our application engineers will discuss options with you. Replace the Mini-PLC-2 processor with a 1771-ASB remote adapter module. Our migration kits include the SoftPLC hardware, software and application conversion services for simple migrations. If your system had multiple RIO or DH+ networks, or other specialty functions, contact us to for an engineering review and quote. SoftPLC is an extremely powerful controller. Even though the PLC-3 was used in large, complicated applications, a SoftPLC can handle the challenge! Minimal hardware changes are required in most cases. Logic conversions are normally 95% or better. The converted logic resembles PLC-5/SLC-500 logic, so if personnel are familiar with those models, minimal re-training is required. Many PLC-3's communicated to HMI/SCADA using PLC-2 compatibility mode which is supported by SoftPLC, so these often do not require re-programming. 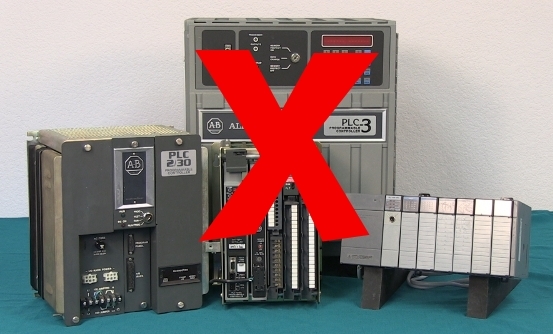 PLC-3 programs often require manual intervention after the bulk of the program has been automatically converted. We will provide a quote for the conversion after we receive the files and an application engineer has reviewed them. Using your PLC-3 programming software, export the logic to .ACH format (text). If you are using TOPDOC PLC-3 or 6200 software, the .LOB or .PLC formats are also acceptable. If you do not have PLC-3 software, we can include the cost of "renting" TOPDOC PLC-3 as part of your conversion process. Export any documentation from your PLC-3 programming software to text format. If you are using TOPDOC PLC-3 or 6200 software, the .DBF and .CMT formats can be used directly. Email these files to us. With our automated PLC-3 to SoftPLC conversion utility, we will run a test and report the automatic conversion success rate, as well as the quote for the conversion services. After your approval, we will convert the logic and documentation to a single XML file that will load into TOPDOC NexGen. Download the application to the Smart SoftPLC using TOPDOC NexGen. Other A-B PLC and other vendor's PLC systems can also be converted. We are happy to discuss these with you to explore options, feasibility, and costs. Do you have something else? It doesn't hurt to ask! Slide show highlighting features and benefits of of SoftPLC upgrades/migration of older A-B PLC systems.